We are here to help you with your audio visual needs for your wedding. We have a massive selection of equipment available for your every need. To keep our basic information package short, we have listed our most popular items with pricing for your reference. If you require anything above what you see listed here, please contact our office and we make sure you are taken care of. All prices are for daily rentals and 5% GST will be added to all prices. Weekly rental rates are available by contacting our office. All rentals are subject to equipment availability. A valid credit card or cash deposit (of the replacement value of the equipment) is required to rent any equipment. Handheld microphone & cord - $25.00. Wireless handheld microphone - $40.00. Wireless lapel microphone - $40.00. Wireless head boom microphone - $40.00. Powered speaker with stand (Single) - $90.00. Powered speaker with stand (Pair) - $160.00. Laptop Sound Connection Kit (used to take an audio signal from a 3.5 mm plug to XLR or ¼ inch input) - $15.00. 6’ XLR cord - $10.00. 50’ XLR cord - $25.00. Data Projector (3000 Ansi Lumens, comes with 6’ VGA cable and remote control) - $150.00. Audio Visual Cart - $15.00. Tripod Screen (6’ x 6’) - $40.00. Tripod Screen (8’ x 8’) - $50.00. Dress Kit for 6’ x 9’ Fast Fold Screen - $75.00. Dress Kit for 9’ x 12’ Fast Fold Screen - $100.00. 75’ VGA Cable - $25.00. 75’ S Video Cable - $25.00. Data Projector, DVD player and 8’ x 8’ Tripod Screen - $195.00. 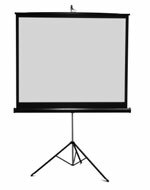 Data Projector and 8’ x 8’ Tripod Screen - $185.00. 1 Powered speaker with stand & Wireless lapel mic. - $125.00. 2 Powered speakers with stands, Wireless lapel, handheld or head boom mic (your choice), CD Mix Unit (Dual CD Player & Mixer Combination with 3 channels of audio inputs) - $225.00. Delivery and pickup within the City of Lethbridge - $100.00. Setup and Take down rates for equipment - $75.00 per hour. Powered speakers above are best suited for speaking events. Larger sound system rentals are available, please contact our office for information.